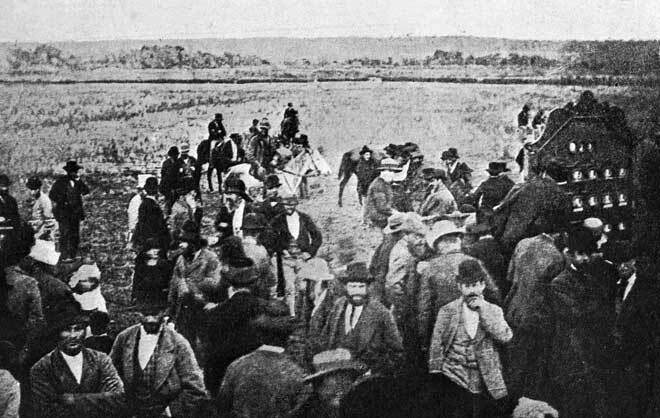 This 1883 photograph shows the first race meeting at Lethbridge's Run, Feilding, at which a totalisator was used. The tote machine can be seen on the right. The Feilding Jockey Club, formed in 1879, was an enthusiastic user of the recently introduced machine. This primitive, hand-operated version calculated only win bets, but later more sophisticated totalisators included split-pool betting, doubles and other types of bet. The totalisator was popular with clubs and the government because they could collect a percentage of the wagers.